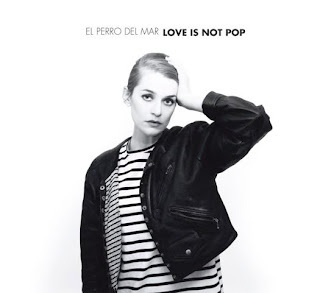 El Perro Del Mar's "Love is Not Pop." The White Stripes called: they want their shirts back. 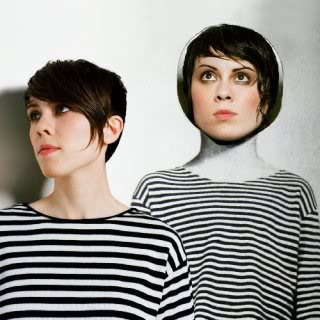 Tegan and Sara's Sainthood and El Perro Del Mar's Love is Not Pop CDs came out last week, and they both feature the same jailhouse-style striped shirts on their covers. "Peter Thompson found that if two identical squares are drawn side-by-side, one with horizontal stripes, the other with vertical stripes, then the square with the horizontal stripes looked taller and narrower than the other with vertical stripes. "I found that this relates to clothing too," said Thompson. "In HelmHoltz's Handbook of Physiological Optics he noted that ladies' frocks with cross stripes on them make the figure look taller." Which explains why referees, prisoners, and the American flag, all look so natty, healthy, and svelte. T&S also did some pretty neat things with stripes in the video for "Hell." The White Stripes have no case. Clearly, these are white shirts with black stripes. Or are they black shirts with white stripes? Depends on the thickness of the stripes, methinks.